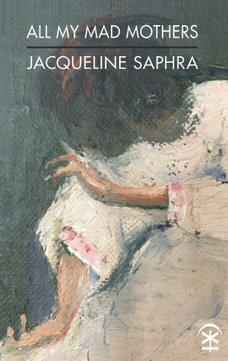 As its title suggests, Jacqueline Saphra’s latest collection, All My Mad Mothers, is about women and family. Saphra’s poems examine the multifaceted nature of femininity, individual and universal, moving within, between and beyond the roles designated to women. This applies particularly to familial roles she inhabits – mother, daughter, stepdaughter – but also examined is the woman as guardian, friend, witch and – the other half of the title – madwoman. properly taught how to make an exit. the way that water soaks through canvas shoes. and still I stayed because you asked me to. Saphra intersperses poems with short, untitled prose passages of her own family growing up, shifting the exploration of women and familial roles from the universal to the personal. Here, the writing takes on a quietly confessional tone, describing memories and paying tribute to all the mad mothers she’s known throughout her life. The topic of motherhood is enduringly popular in feminist poetry. Saphra’s collection calls to mind poems like Carol Ann Duffy’s “Before You Were Mine”; these are honest explorations into the love one feels as a mother, but also the sense of entrapment in such a role – such “helpless love”, as Saphra puts it, can bring. All My Mad Mothers approaches its subject matter from both perspectives, with tones ranging from the disturbing to the delicate, bolstered by the inclusion of the poet’s own experiences.